It goes without saying that all the candidates, without exception, deserve a hearty round of applause. Running for elected office takes time, money, energy and commitment and when it’s all over - and to rub salt into the wounds - the voters never say thank you. That’s not their job. The winners, of course, are now fair game. 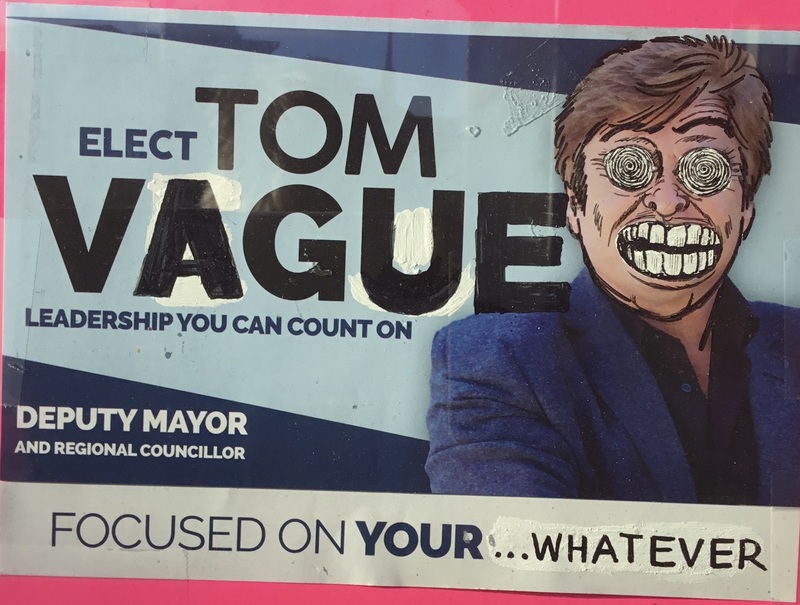 Tom Vegh had the most to lose in this election and he did the business. He abandoned his safe berth in Ward 1 to make a pitch for the Regional Councillor vacancy. It could have gone pear-shaped but the gods were smiling on him. The entry of the green Joan Stonehocker into the race probably siphoned votes away from Chris Emanuel whose platform was way too negative. That 40% tax hike was never going to stick. Emanuel’s loud insistent drumbeat on tax drowned out everything else. At no point in his profile does Tom mention a new library and seniors’ centre. Clearly, it is work in progress. I shall be following Tom’s efforts closely as he seeks to deliver on his promise. Taylor was always going to win. He has a spider’s web of contacts that cover the entire Town – his campaign launch was proof positive of that - and they all turned out for him. We have two new councillors – Ward 1’s Grace Simon and Ward 4’s Trevor Morrison – and a retread, Victor Woodhouse, in Ward 2. They will be joining the old gang of four – the re-elected councillors (Jane Twinney and Bob Kwapis) and those who didn’t face an election because there were no challengers (Kelly Broome and Christina Bisanz). It will be fascinating to see how Taylor handles the job of Mayor with all the new faces around him. His predecessor, Tony Van Trappist, was content to play the part as Chairman of the Board – only venturing an opinion when he was backed into a corner and had no other option - allowing Taylor to set the agenda and, largely, dictate policy. Van Trappist never reported back on what was happening at York Region – and not just because he wasn’t paying attention. He left it to Taylor. I can’t see Taylor deferring to Tom Vegh. Dive in at the deep end. For what it’s worth, my advice to the new councillors is to dive in at the deep end. Don’t wait for that brilliant thought to materialise before opening your mouth. Get stuck in. The former Ward 4 councillor, Tom Hempen, took years to find his voice and that was a tragedy because he often had interesting things to say. Some councillors also have an unstated policy of never voting against a staff recommendation. Don’t do it. It leads to lazy thinking. And it begs the question: why bother having an election at all? If they bother to stir themselves councillors can shape, mould and lead public opinion and get people re-engaged in local politics. In an era of declining voter turnout that surely must be a good thing. In October 2018 voter turnout in Newmarket was 34.7%. In 2014 it was 36.8%. Should politicians block some people from reading their tweets? 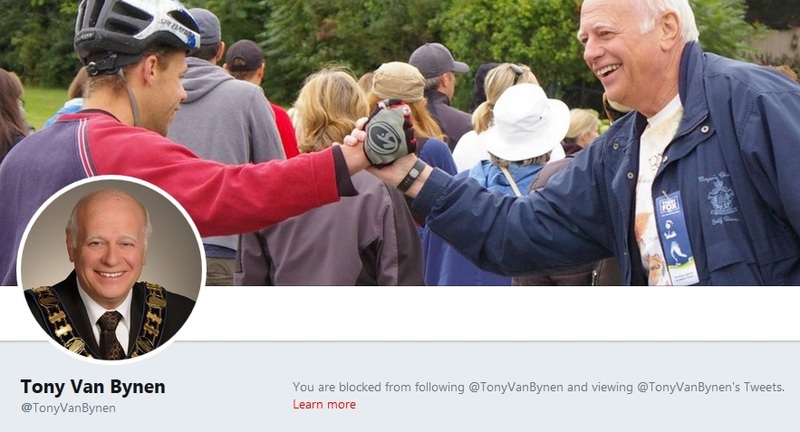 Jim Watson, the incumbent Mayor of Ottawa, and Tony Van Trappist, the retiring thin-skinned Mayor of Newmarket, share one thing in common – they block certain people from reading their Tweets. Van Trappist has fiercely defended his right to block critics. Even people like me who are never abusive. At least not intentionally. I can say things that people may find offensive but we live in a free country. This isn’t Saudi Arabia and I don’t have to worry about getting my fingers chopped off for writing something Mohammed bin Salman finds disagreeable. I remember Newmarket’s John Heckbert bravely telling councillors in February 2016 that it was a mistake for them to block people from accessing their social media platforms. This upsets Van Trappist no end. “Yes. You are entitled to say what you have (said). And if you have something to say my view is you post that on your site. My page represents my views and anything that comes from my twitter feed is believed to be endorsed. So I don’t feel in the slightest way obligated to advance an argument that is contrary to my views. So I don’t apologise for blocking certain people." “Mr. Watson is also wrong when he says his Twitter account is a personal one. That’s just not true – even if he is the only person operating it, as appears to be the case. The account is being used by the elected chief executive of Ottawa to sell his election platform, to campaign, to announce events he will attend as mayor, to cheerlead for himself and to communicate vital information to city residents. Maybe Van Trappist’s Tweets are pure gold. Sharp, witty, insightful. In July I asked my MPP, Christine Elliott, the Deputy Leader of the Ontario Progressive Conservative Party, for her views on whether the Chair of Durham Regional Council should be elected by the voters at large or by a handful of members of the Regional Council. Durham is home to her former riding and where she still lives. Before 2014, the Chair of Durham Regional Council was appointed by its members – as happens in York Regional Council today. But there was a referendum in Durham’s constituent municipalities in 2010 (with voters overwhelmingly in favour of direct election) and the Region switched from an appointed Chair to one elected by the voters at large in 2014. As I type this out the election in Durham is in full swing with five candidates battling it out for the job. Here, in York Region, we have the silence of the graveyard. We hear no clash of opinions between Steven Del Duca and Mario Racco and others, grabbing the attention of the voters, offering alternative visions of the future. York region’s population is bigger than PEI, Newfoundland, Labrador, New Brunswick, Nova Scotia or Saskatchewan, and is rapidly closing on Manitoba. Yet the person who leads York region will be indirectly elected by 20 people on 6 December 2018 at the inaugural meeting of the new Council. 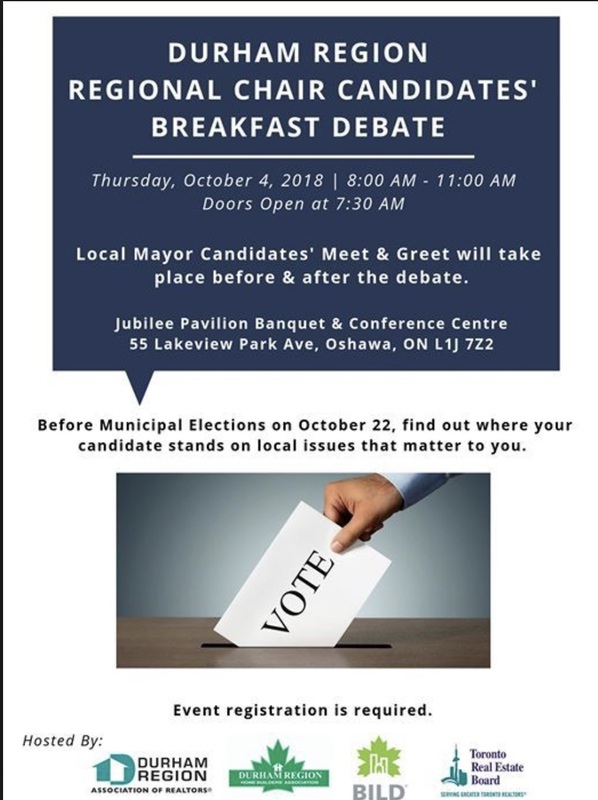 The first highly anticipated direct election by the voters at large for York Regional Chair was cancelled by Doug Ford with Elliott, now MPP for Newmarket-Aurora, uncritically supporting his decision. From 2006-2015 Elliott was the MPP first for Whitby-Ajax and then Whitby Oshawa in Durham Region. So far as I can gather Elliott chose not to express a view on the direct election of the Chair of Durham Regional Council and refuses to engage with me on this major issue of public policy. Elliott does not reply to my emails and neither has her constituency assistant, Sarah, acknowledged them. I have twice asked for an appointment with Elliott and my requests disappear into the ether as if they had never been made. This is not how the system is supposed to work. Doug Ford is on record boasting about how he returns calls to constituents and praises PC MPPs who make a habit of doing this. But that's not Elliott’s way. She didn’t meet people arguing for an increase in the minimum wage who asked for a meeting several times. I’ve asked candidates running for Durham Regional Chair if Elliott expressed a view but they can’t recall. She kept her views to herself. In all her years at Queen’s Park she was silent on the issue. There is nothing in Durham’s local newspapers. She has left no footprints in the sands. But Elliott is against the direct election of the Chair of York Region. And she won’t explain why it’s OK for Durham but not here. I won't quote you by name unless you specifically ask me to. I am not a member of the Facebook Public Group “Newmarket Votes” but I take a look from time to time to see what they are talking about. 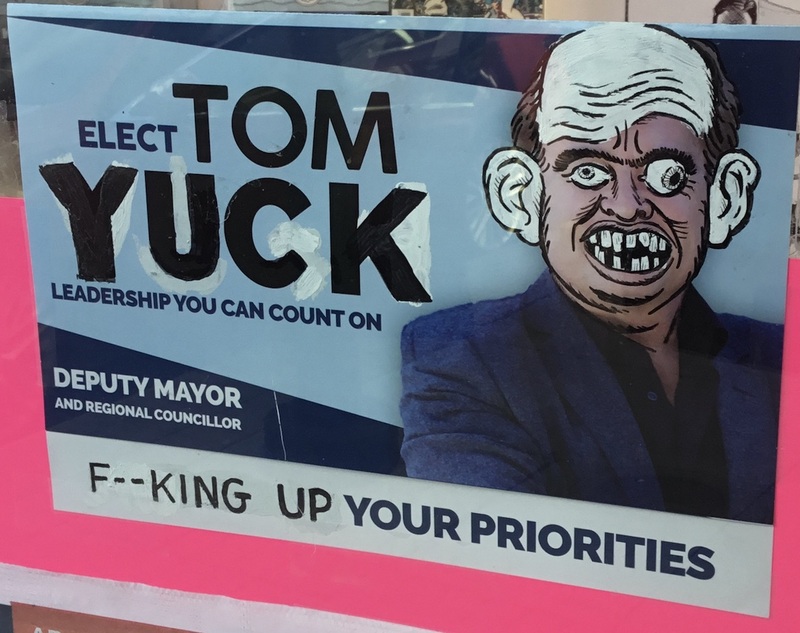 The owner of Main Street’s Fourth Dimension Comic Store, Steven Gilbert, posted some inventive cartoons of our councillor wannabees which were removed by the site’s administrator after a torrent of complaints. Newmarket's History Hound, the straight-laced Richard MacLeod is the Witchfinder General, dubbing the cartoons “demeaning” and demanding their immediate removal. As a student of history he should know better. There is a long tradition of political cartooning, poking fun at the high and mighty and those seeking elected office and long may it continue. Earlier today I wander down to the Comic Store and chat with Gilbert. He admits his cartoons are juvenile and not everyone's cup of tea – the product of a lifetime reading MAD magazines and comics from the same stable. But candidates who have been immortalised by Gilbert’s pen should feel flattered. Better that than being ignored. You can see the full gallery in the window of the Fourth Dimension Comic and Games Store, 237 Main Street South, Newmarket. 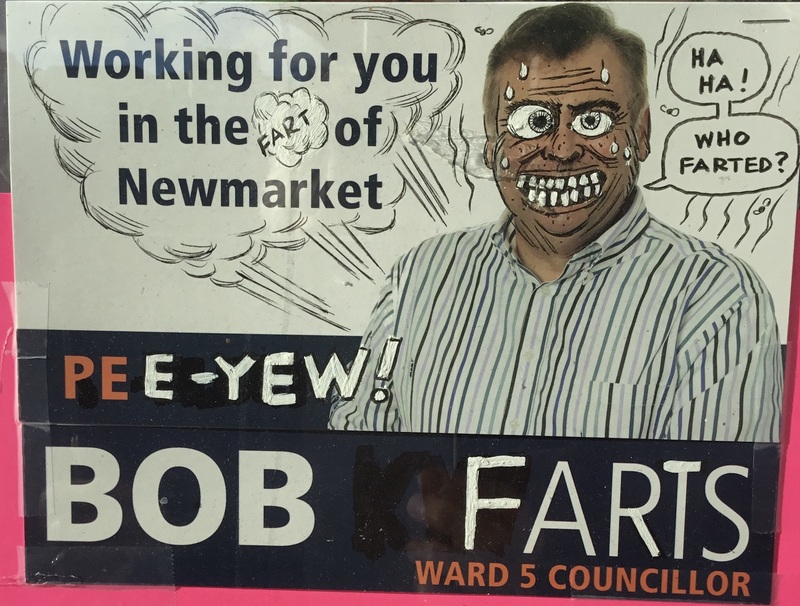 If I lived in Newmarket’s Ward 5 I would be voting for Ron Eibel in the election on Monday. 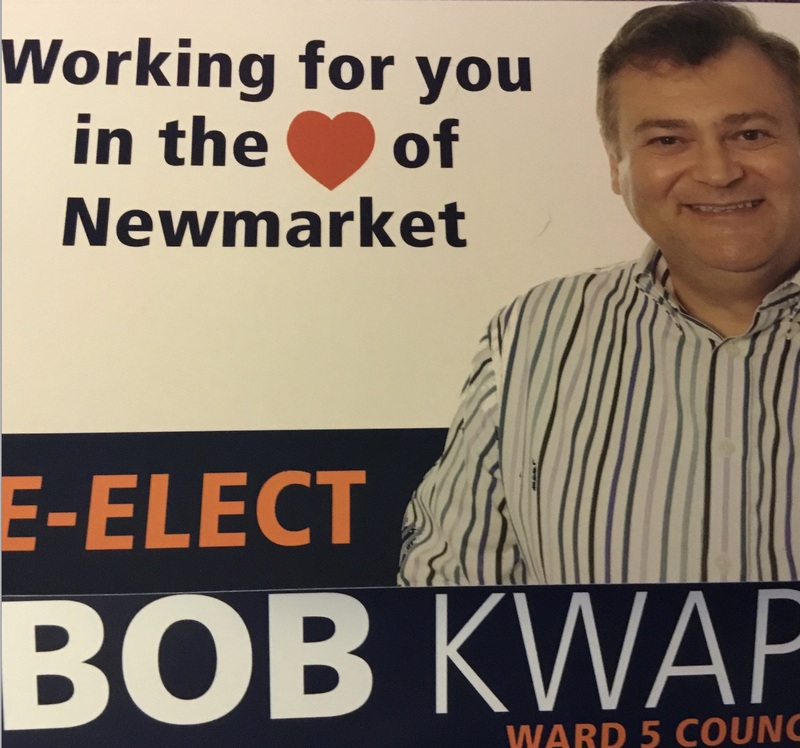 The incumbent councillor, Bob Kwapis, won the downtown Ward in a crowded by-election in 2016 after Joe Sponga threw in the towel for reasons which have never been fully explained. It was a spirited campaign involving seven candidates and Kwapis cruised to victory with 803 votes well ahead of the runner up Darryl Wolk (479 votes) and Tracee Chambers (444 votes). Ron Eibel came fourth, limping home with 105 votes. But I am sure he will do a lot better this time. Kwapis spent a fortune on the by-election campaign. Money was no object. I’ve been re-reading the blog I wrote two years ago about Bob Kwapis who, then and now, comes across as jolly and engaging. That hasn’t changed. He smiles a lot and that’s good. But does he deliver? How does he measure up now that we have seen him at work for two years? Kwapis is skilled at self-promotion. His election leaflets list “recent achievements” which suggest he is the go-to man if you want something done in the Ward. But steer well clear of Bob if you have a planning problem. If he invites himself to your house offering to help just say no. More likely than not he’ll side with the developer. The Clock Tower is, of course, the issue that dominated the last term of Council. It is an incontestable fact that the Director of Planning, Rick Nethery, misled the public by allowing the development’s FSI (a measure of density) which he knew to be false to appear in the report going up to councillors for decision on 28 November 2016. Kwapis is “very proud of the recent success in negotiating the Clock Tower development agreement”. But what part did he play and what has he done since then? Coleen Forrest, the wife of the developer Bob Forrest, told us on 4 May 2018 that the new concept plans for the Clock Tower would be available “very soon”. That is getting on for six months ago. Has Kwapis asked what is causing the delay? Is Kwapis being proactive or just being a spectator again? The historic commercial buildings on Main Street have been left empty and boarded up for years now. What happened to his plan to get displays in the empty shop windows? Are the old buildings prepared for winter? Will they be heated? Has he asked to see the interiors? Is he doing anything more than taking the credit for what people like Ron Eibel have done. Ron Eibel was a lead character in the Clock Tower story. He was instrumental in blocking Forrest’s plans. And he has stuck with the issue which is still, in large part, unresolved. 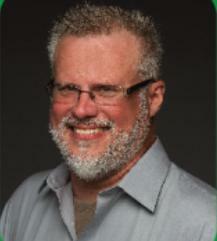 Ron Eibel is a quick thinker and is someone prepared to ask difficult, even awkward, questions. In the new Council he would be a burr under the saddle – but not in a disruptive non-collegial way. To be effective on Council you have to get along with people of all stripes and he could do that. But we need a counterweight to the groupthink that infects and contaminates Council decision-making. 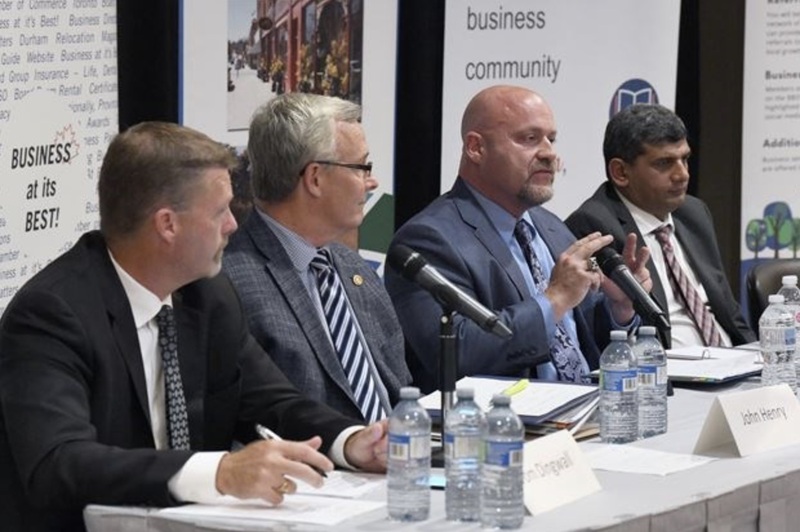 There has been no candidates’ debate for the Ward 5 election this time around but I remember the one held at the Newmarket Theatre for the 2016 by-election. Eibel was the only candidate without a note in front of him – answering the questions fluently and showing a firm grasp of ward issues. I know you have a backbone and that to me means everything." Perhaps Bob Kwapis could now show some of that backbone by asking Rick Nethery when he first realised key information on the Clock Tower was false.